Periscope is the latest tool from Twitter, aimed at allowing people to simply live stream video from their phones and tablets and then make them accessible afterwards. It is likely to compete with Meerkat - a similar service but which does not have non-live functionality. Think of it as the Snapchat to Periscope's messenger. 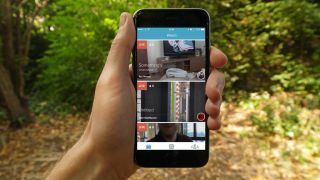 TechRadar "Periscoped" our daily TechRadar Talks video to check out the new service and give our own view on whether this is a thing, or just a momentary fad. The process is incredibly straightforward - critical in getting video to the web quickly should anything interesting happen. Given the lack of anything especially fascinating happening in London we filmed two of us being filmed (meta) for our YouTube TechRadar Talks. You simply type the name of your broadcast and click to start the stream. The quality isn't the best, but perfectly reasonable, and people join 'live' and can comment. As we talked about media streamers, we were streaming on media and our 'cameraman' was being given instructions. When you're done, the video remains online for people to view in their app, and we're expecting more Twitter functionality and integration pretty soon. You can only watch through the app - not the site and not even on Twitter just yet. It's a fun app and could have an impact should it be on the device of someone that's at a big event. You can download it for iPhone/iPad (only at this point) on the App Store. And make sure to keep an eye on our further adventures with Periscope. Our username is @TechRadar - easy! UPDATE: And the reason why some of the functionality is missing? Well Periscope has tweeted: "Don't worry! Twitter sharing be available in a 3-4 hours. App was discovered a few hours earlier than we would have hoped :)"